For a comprehensive understanding of the structure born noise behavior of an electric car drive unit an FEA model of the gear motor was created as shown in the top figure. This model includes the three-part housing, the stator, the rotor, the integrated spur gear and the differential gear. The unknown material and coupling parameters within the rotor and the stator as well as those between the stator and the housing and of the housing parts among themselves were determined by the step-by-step comparison between the results from experimental and numerical modal analyses. 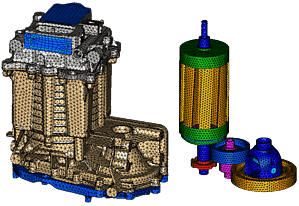 Single components, subassemblies and the complete drive unit were investigated for obtaining a reliably correlated FEA model. The shrinkage between the stator and the housing turned out to be of special importance. The mid figure shows the comparison of a transfer function obtained from measurement and simulation as an example. 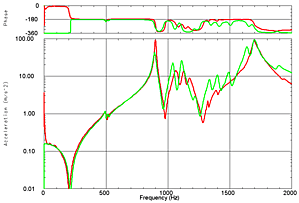 The validated FEA model of the drive unit was used for sensitivity analyses with respect to various excitation mechanisms. Besides unbalance forces, various electromagnetic force patterns and the parametric excitation at the gear mesh frequency were investigated. 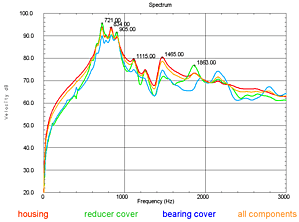 As an example, the bottom figure shows the spectral sensitivity of the housing surface velocities with respect to excitation by alternating electromagnetic forces with a given force pattern. The curves show the mean surface velocity of the three housing parts and of the complete housing. For this chosen force pattern pronounced noise maxima are observed around 800 [Hz].